Exercise helps to keep the body fit and the mind sharp, and it is something that people should do when they are young, when they transition into adulthood, and when they become seniors. However, most people do not keep up with their exercise. Life seems to get in the way, and exercise and fitness become just a dim memory, something that they only do occasionally. The trouble with putting their health and fitness onto the back burner is that they will have more problems getting around as they age. However, that doesn't mean that a person can't try to reverse the process, at least a bit. No matter your age, exercise is going to be a healthy activity. As long as the doctor says that it is okay for to start exercising, you will be able to do so. Best of all, seniors can find some great activities that are fun and not too stressful on the body. Those who are in their later years will be able to discover quite a few fun and healthy hobbies that they can start. Here are just a few ideas that will help to get the blood flowing again. Swimming is a great activity, and many towns and cities have local pools for those who do not have pools at their home. Some fitness clubs also have pools at their facility. Swim on your own or join a water aerobics class. Aerobics in the water is very healthy, but it causes less pain and stress on the joints. It is often possible to find some classes that cater to seniors. Other classes are likely available at the local gym as well. 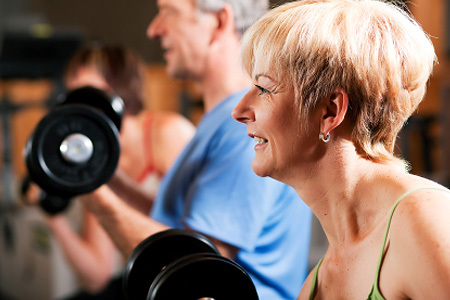 Many fitness clubs have aerobics and even weight training programs specifically for senior citizens. These options are great for many because they have professional trainers, and it is possible to meet some other people who are facing the same types of health challenges. Of course, it isn't necessary to join the gym to get healthy as you age. In fact, some people might not be able to fit the gym into their budget. Instead, it is possible to get some great exercise simply by getting out and going for a walk. Find some trails through the park or into the hills. Even walking around the block and visiting with friends and neighbors along the way can be a mild but stimulating form of exercise. When first starting a new fitness plan after years of no exercise, it is important that a senior begin slowly. Rather than putting undue stress on the body and causing injury, it is a healthier approach if you being with shorter sessions. As the body gains more strength and endurance, those sessions will increase in duration as well as intensity. Once a person starts working out, the energy levels will rise. They will feel stronger and more confident. It's a great feeling for people no matter how old or young they might be!